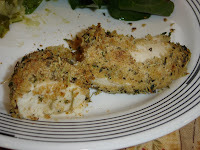 Last night I made baked herb-crusted chicken breasts to eat with leftover asparagus risotto. 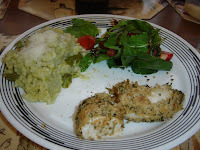 The risotto recipe is from the March 2002 Bon Appetit, and in that issue the risotto is paired with this chicken recipe. It's so simple: marinate chicken in fresh lemon juice for an hour, melt olive oil & butter then brush it on the chicken, coat chicken in the bread crumbs, bake at 450 for 20 minutes. We buy Italian bread crumbs and I added dried basil, parsley, & rosemary (instead of fresh herbs). Delicious! We added a salad for extra veggie. Usually our salads are whatever we have lurking the the salad crisper!! Last night it was greens, red pepper, & tomato with homemade balsamic dressing.